This page will help you get started on adding new cards and modifying old cards in the BotArena project. 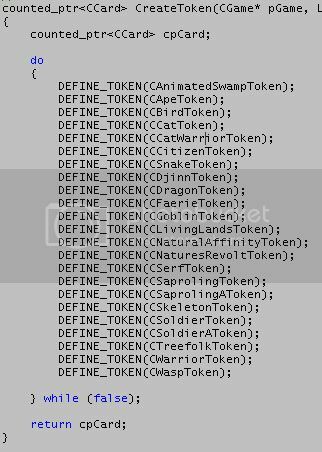 You will be able to test your additions and changes before posting the new code in the forum. •	Apply all Visual Studio related Windows Updates. You may need to do multiple rounds of updates to get all of them. •	TortoiseSVN from http://tortoisesvn.tigris.org/. This software will help you to download and upload source files from our code repository. Note that this free software modifies your Windows shell to show additional information about files. You may be able to turn off that feature only. It also installs command line tools ‘svn’ so you can also use it from command line only. •	(Optional) AnkhSVN from http://ankhsvn.open.collab.net/. You do not need TortoiseSVN if you install this one. AnkhSVN integrates into your Studio environment and so you can update and commit changes easier. However from my limited testing of it, it is buggy (but still free.) In my opinion TortoiseSVN is a lot more stable. •	(Optional) VisualSVN from http://www.visualsvn.com/. This is good product and it integrates with TortoiseSVN and Studio. 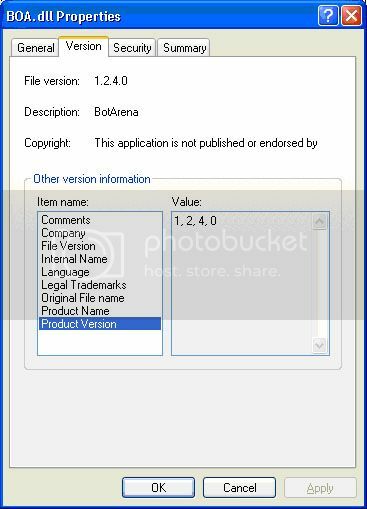 * Download the latest BotArena release and install the msi file. 4. It will ask for you user name and password if you haven't entered it already. It will then download all the source code. 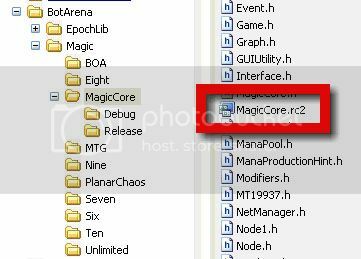 To open the whole project you must open the file "MagicWand.sln" which can found on "Magic/magicwand" folder. To fix a simple typo of a card, all you need to do is to modify the card’s corresponding text in the string table above. To fix a broken card’s code, locate and modify the card code in the .cpp file. Now if you edit any file in Studio which is tracked by TortoiseSVN, you should see the green check mark in Windows Explorer change to a red exclamation mark. Modify the third number (‘4’ in this case) to a higher number. 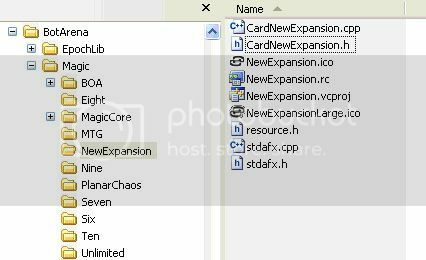 Note that doing so will cause all card expansion modules’ version number to be changed, not just the card project you are working on. After you have done the above, you are ready to let the computer to do all the hard work of compiling your project. To do that, on Solution window, right click on "BotArena Setup" and select the "build" option. Of course you can compile only a dll file, in the same way. In some rare occasions when your changes are not taking effect or the project is acting weird, you may need to use the ‘Rebuild Solution’ option instead to clean the system for damaged files etc. Now just copy the new dll file and overwrite the one installed by BotArena and you should be able to test the change. After you have done all your changes, you can right click on your working folder e.g. 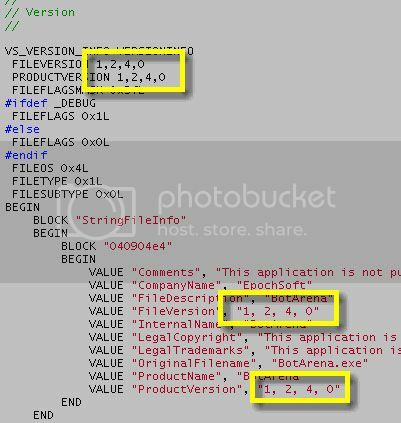 'C:\BotArena' and select 'SVN commit'. Wait for the system to find all the changes you have done since your last commit. Enter a comment in the top box, e.g. 'Added Serra Angel card'. Click OK and the changes will be uploaded to XP-Dev and ready for download by other members. Note that since Eager Cadet’s code is already defined in Seven’s project, this is all you need to do. One important thing is that you must make sure the IDs used in the new card text is the NEXT highest number from the last one. In this example, the number ‘3431’ is important. The reason is that the core engine stops searching cards once an ‘empty’ slot is found in the card project. So if you put down ‘3432’ and ‘3431’ is empty, the new card will not be found. After this, follow the compilation steps listed in the ‘Modifying Cards’ section to test the new module. 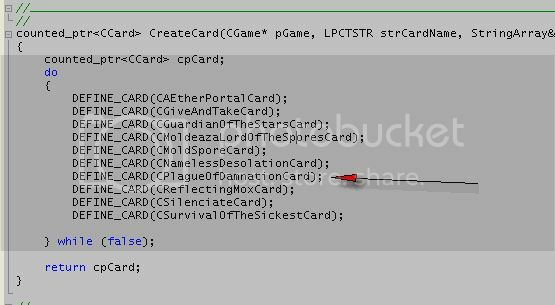 Usually these 3 lines of code is all you need to add in the .h file but the ‘: public CCard’ part may need to be changed to match the card’s purpose, e.g. ‘: public CCreatureCard’ for creature cards. Technical: You are defining a new C++ class and this declaration tells the system that the new card class is ‘derived’ from another existing class. Note that to keep the list organized, the cards in this list is sorted. After this, you are all set and again follow the steps in ‘Modifying Cards’ section to compile and test the new card file. I have created a sample project to use as a template to create new card projects. Follow these steps to rename the project into the desired expansion name. As an example, I will name my new expansion ‘Star Ship’. 2. Rename all files in the directory with names containing ‘NewExpansion’ to ‘StarShip’, e.g. CardNewExpansion.cpp to CardStarChip.cpp. 4. (Optional) Edit the .ico files. You can use GIMP which is a free application to create icons and graphic files. 6. Again using right-click, open the .vcproj file in notepad. Find and replace all ‘NewExpansion’ with ‘StarShip.’ Save and exit. b. Save and close the file in studio after the change. b.	Browse to the StarShip.vcproj folder and select it to add to the solution. 10. Finally you are done. Follow the ‘Adding New Cards’ section above to start adding cards to the new expansion. 2. It should find all the changes since your last checkout. Note that if a file is changed by you and someone else, TortoiseSVN may say the file has 'conflicts'. Don't panic and you can fix the conflict by opening up the conflict editor. You should be able to see what needs to be merged, e.g. you and another person changed the exact same line. 3. Now you have the most up-to-date source code. Before each major release, me or someone from the card team will branch the trunk head to the ‘branches’ URL, e.g. 'http://svn.xp-dev.com/svn/BAOS/branches/1.43.1'. That way I can easily sync all card changes into my own projects. It also provides a fixed reference just in case we need to go back to look at a release’s source code. "To open the whole project you must open the file "MagicWand.sln" which can found on "Magic/magicwand" folder." I am trying to build Botarena and noticed that QT is required. Which version of QT does it need? This is not mentioned in the documentation. Currently we are trying to upgrade the UI, and Korry chose QT to improve it. However we have some important problems and this way is stopped now. Actually, QT is not requered at all, so just open the magicwand.sln file that you can found on Magic/MagicWand folder and that will open the whole project. After that,you can compile the game right clicking on "BotArena Setup" and selecting the "build" option. However, as I said you before, QT version (aka BotArena2) doesn't compile, which could be fixed by us, at least by the moment. Can someone help us here? However when I run the .exe the game window appears without graphics (table top background etc.) and some of the icons are missing (ie the turn stages icons (Untap, upkeep etc are missing from the form) Also the cards are not appearing to build decks with. Do I have to install on my machine my newly built code? To see graphics and cards? Unfortunately I am not a QT person so I am happy to hear the software does not need it. Which S.O. are you using? Try to set the app to compatibility mode with XP Sp3 and try if this help. Currently I am using Win XP SP3 and Win8 64bits (compatibility mode XP SP3) and all is ok. I am running Vista. Botarena the official release works on my machine. I changed the compatibility mode to XP Sp2 on my newly built exe and still the same problem. It appears that my built botarena is not finding some of the graphics resources. After building the game how do you run the game? From an exe or installing the msi? IS it from Visual Studio? Also where is the point you run it from located? What was causing my issue was, I did not have any Botarena installed on my machine so when I ran my new build code from Visual C++ in Coreapp.h some of the paths in the code below were defaulting to C:\Program Files\EpochSoft\BotArena which did not exist and other paths defaulted to where my code was built (M:\BAOS Latest Build). Therefore only some assets were found. I think that I know whre is your problem. Probably, you installed first BA on the epoch folder and now you have selected another folder, but the register points to the first folder. If you delete all entries for BA on the register, and reinstall BA where you want, I think that your problem will be gone.